Spring is a time for rebirth and regeneration of energy that has been seemingly dormant over the winter months. This new moon, we're focused on creating and setting an intention to invite our personal re-birth. To re-energize ourselves and re-emerge with a sense of renewed purpose. Notice a theme here? Re- is Latin, used with the meaning “again” or “again and again” to indicate repetition, or with the meaning to go “back”. The intention that you set now will be especially powerful, as this new moon is coming on the heels of a Mercury Retrograde-- the backwards or reverse pattern of motion that we've been in over the past 6 weeks since the retrograde began. This a powerful time for do-overs, lovers. We've been in a perpetual state of revisiting, reviewing and relearning these past few weeks, and now it's time for our glorious rebirth and re-emergence into the beautiful light. Mercury seriously gets a bad rap for knocking everything out of alignment-- from schedules to technology, to people's behavior. For far too long, Mercury has been the fall guy for falling back in the sack with exes and many other poor decisions and words exchanged. Not any longer. We're taking our power back during this new moon as Mercury stations it self direct once again. By reflecting and examining what the universe gifts us during retrograde periods we become more self-aware and capable to grow and evolve through all of life's messiness. Luna Dolls who are coming to our Luna Rising Retreat in Mexico at the end of the month are invited to delve deep and learn how to transmute Mercury Retrograde's potent energy during our New Moon Circle Call, which you can still reap the benefits from if you, too, are interested in how you can use Mercury as an ally. Say 'no more' to victimhood. It's time to be the alchemist and take conscious steps in our evolution process. And this simple candle meditation is one immediate action you can take to spark the flame of your power. Step 1: Clear the energy space with your sage or palo santo and light your candle. If it's at eye level to where you'll be seated, that's even better. Step 2: Get into a comfortable seated position. Step 3: Close your eyes and breathe in some good prana (life force, energy), and exhale any tension in the body. You can do a quick body scan from your crown, through all of your chakras, if you like. At the base of your spine, at your root, allow yourself to feel grounded to the earth. Step 4: Once you feel settled, let you eyes flutter open to focus in on the flame from your candle. Step 5: Allow yourself to feel the fiery energy of the flame. Hold a soft gaze for 1-3 minutes while you continue your inhalations and exhalations. Love our monthly rituals? Watch highlights from our community Cacao Ceremony & Sound Healing Meditation in the Riviera Maya. What can I do to physically, energetically and spiritually prepare for this next phase in my life? Where do I need to create space in my life for this rebirth? What is my intention to bring forth? Step 7: Close your eyes and sit with the questions. Don't worry if nothing comes up immediately. Give yourself time to internalize them and let your inner awareness bring the answers to you. You can jot down anything that comes up in your journal or if you spontaneously receive an answer later when your meditation is complete, like I often do, make a note of it in your phone and put it on paper in your journal later. 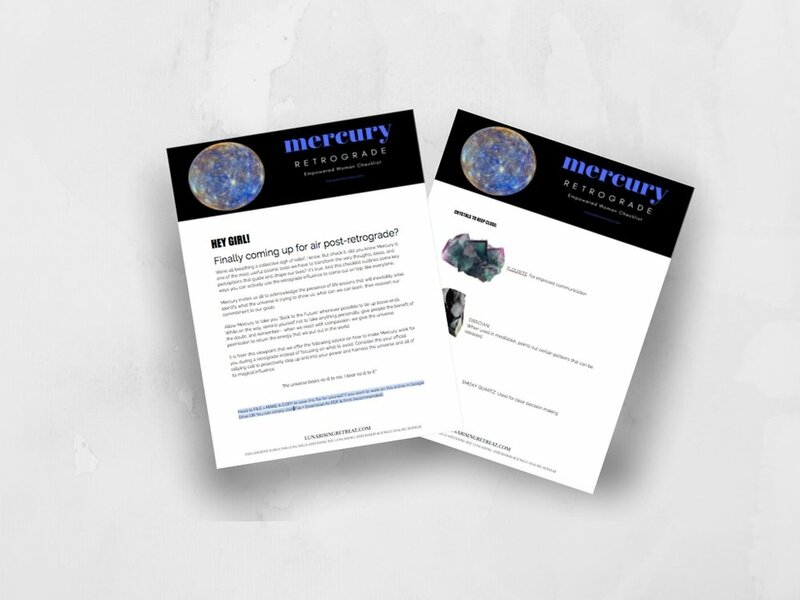 Get access to the tools you need to overcome the stress from Mercury Retrograde. That's it! You've planted an intention for great change and rebirth. If you're planning to come to Luna Rising, be sure to bring your journal or Empowered Woman Checklist with you so we can revisit these intention(s) that you set when we meet in person under the light of the full moon in the Riviera Maya Jungle. Have you been looking for a sister tribe that will hold space for you and your dreams? Well, keep reading. My Sisters in Spirit and I are teaching women like you to raise their vibration by using holistic wellness practices—including clean eating, yoga and meditation. We are sharing principles that will help you become grounded in your beliefs about your inner feminine power and capabilities so that you can manifest the life of your dreams. This is no ordinary retreat, Luna Rising is firmly rooted in holistic wellness, ceremonial reverence and sisterhood-- the pillars that modern woman are coming to realize are needed to lead a healed and fulfilled life.